This map is interactive but may not work well on all internet browsers. Text directions are below. 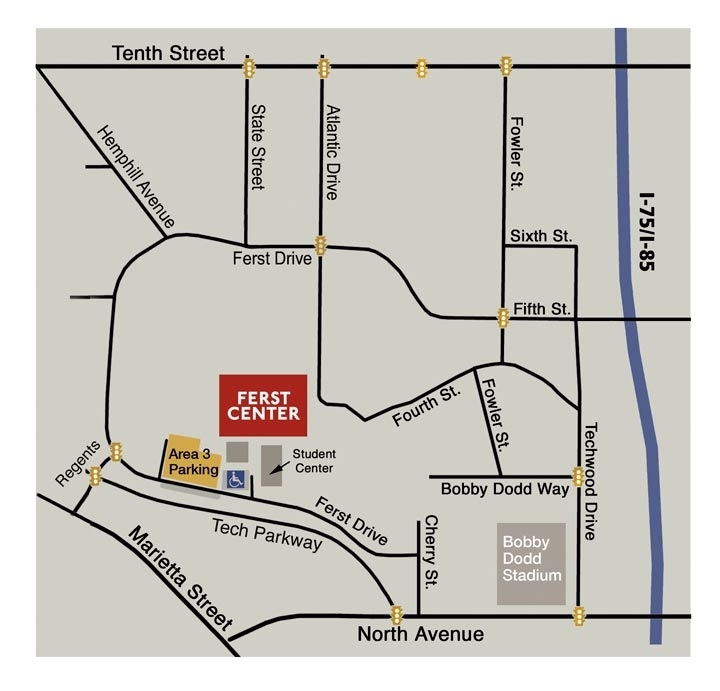 The Ferst Center offers ample, well-lit parking, including accessible parking, for evening and weekend events in AREA 3 Parking adjacent to the Student Center and Smithgall Student Services Building on Ferst Drive. The Ferst Center address is 349 Ferst Drive NW, Atlanta Ga 30332. For information please call 404-894-2787 or 404-894-9601. Alternative Directions heading southbound on I-75: Exit at Howell Mill/Northside Drive Exit. Follow the exit ramp past Howell Mill and exit at Northside Drive. Turn right onto Northside Drive. After the 10th Street intersection, veer to the left onto Tech Parkway. At the first light turn left onto Regents Drive. Take an immediate right onto Ferst Drive. Turn left at the first driveway for the AREA 3 Parking Deck. Travel north on I-75/85. Exit at West Peachtree/Spring Street. Turn left at 2nd light on West Peachtree. Turn left at the first light onto North Avenue. Continue on North over the interstate to Tech Parkway (at the 2nd light) and turn right. Go to the first light and turn right on Regents Drive. Take an immediate right on Ferst Drive. Turn left at the first driveway for the AREA 3 Parking Deck. Turn south on Hemphill Avenue. When Hemphill ends at Ferst Drive, turn right and follow Ferst Drive. After the first stoplight turn left into the driveway for the AREA 3 Parking deck. Take 5th Street from Midtown Atlanta (accessible from West Peachtree St. or Spring St.) across the interstate onto campus where 5th Street becomes Ferst Drive. 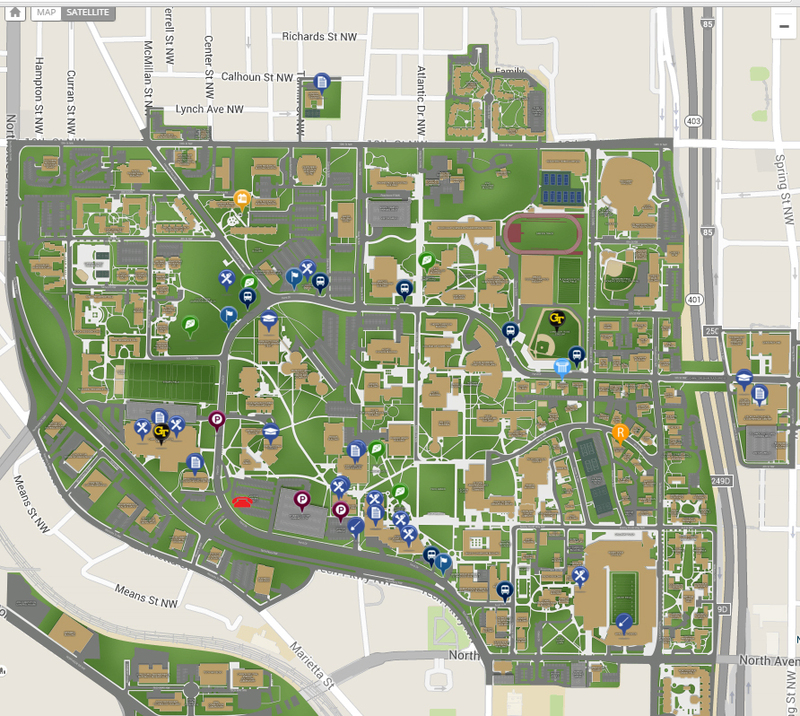 Follow Ferst Drive around campus. After the third stop light, turn left into the driveway for the AREA 3 Parking deck. Head north on Northside Drive. Turn right onto North Avenue. Follow North under the bridge and turn left onto Tech Parkway at the stoplight (the Coca-Cola building will be on your right). Follow Tech Parkway to the next stoplight and turn right. Then make another immediate right onto Ferst Drive and turn left into the driveway for the AREA 3 Parking deck. The closest accessible parking is available in the AREA 2 Parking lot. AREA 2 is located adjacent to the AREA 3 parking deck. Additional accessible parking is available behind the parking deck in AREA 3 Parking. Instead of making a right turn into the parking deck, continue down the driveway and you will see the accessible parking signs at the end of the drive. To take MARTA to the Ferst Center, go to the Midtown Marta Station. Exit the station on the side opposite from 10th Street. Look for the Tech Trolley – a yellow and black bus designed like an old-time trolley – and that will take you to the Georgia Tech campus. There is no charge to ride the Tech Trolley. It runs about every 15 minutes. Exit the Tech Trolley at the Campus Recreation Center (CRC). Cross the street from the CRC and take the sidewalk that heads away from the street to the Ferst Center, which is on the left about 100 yards. Look for a white sculpture in front of the building. You can also take the #113 MARTA bus to the Tech campus. The administrative offices are located in the Office of the Arts in the Charles Smithgall Student Services Building, 353 Ferst Drive, Suite 233. The building is located next to the Student Center. Parking is available in the AREA 2 visitor parking lot and if this lot is full, use the AREA 3 visitor parking lot. Both lots are paid lots. Please read the following information closely for driving and parking instructions on the Georgia Tech campus. Reservations for school day performances usually are made through the individual performing arts companies, instead of the Ferst Center Box Office. If you have questions, please call 404-385-4684. Parking conditions on campus prevent school groups from arriving early or staying late to eat lunch on campus. Please make other arrangements for eating sack lunches on your field trip. The Varsity Restaurant is located nearby on North Avenue, and this is a popular fast-food restaurant that can usually accommodate large groups purchasing lunches. Please allow extra time in planning a field trip for traffic and parking. Contact the Ferst Center for complete specialized instructions for large groups and bus drivers which include directions and parking information at 404-894-2787. The Ferst Center loading dock is located at the rear of the center and is used by companies making deliveries and by performing groups and others loading equipment into the theater. 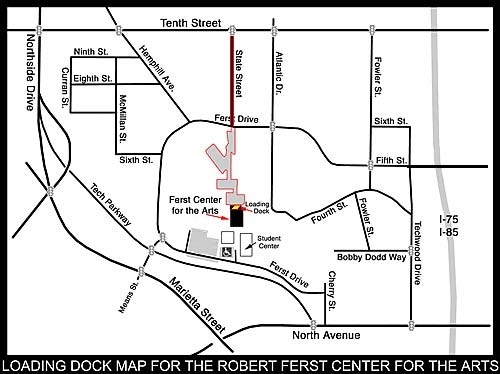 The entry point is at the intersection of Ferst Drive and State Street. Please call 404.385.1923 for exact directions prior to arrival.